I’ll start with a disclaimer; this post isn’t for the casual reader. I’m going to dive into my methods unlike anything I’ve done before. Why? A lot of post processing fun went into the following images and I want to share the knowledge, after all, I wouldn’t be doing this if others didn’t share the wealth. Before I dive in, let’s start with some background. When the idea “Fiction - A Fashion Series” with Scooter Ray finally came to fruition a few months ago, I had two models in mind and one of them was a 6'6" UofL high jumper named Mike Edwards, from Manchester, England, here in Louisville on scholarship. I first met Mike on a editorial shoot for The Voice Tribune back in April, I really dug his calm ambiance and tone, but it gleamed through photos, many times stealing the show. We stayed in touch for the couple of months to follow and he went overseas to several track competitions. In the meantime I was working up this Fiction series. At some point we scheduled a date and it looked like it just wasn't going to happen with Mike, he would still be in Europe. But, when Scooter and I sat down and decided to take our time and do this thing right, we happened to nail down a date during a small window of time which Mike would be home in Louisville before he left for Paris, France. Just like the Taylor Brynne shoot, things moved quickly and the date came sooner then we expected. Once again, I was freaking out for no reason. Scooter and I had another great discussion and the ideas were on the table. Within two days we had the outfit prepared and the concept planned. Day of the shoot, started off pretty frantic, I had 20 minutes to pack up get to Home Depot and then downtown, I was racing and so was my mind. I walked into HomeDepot with the intentions of picking up a small $10 piece of plastic glass and walking out. What I found was several options and my ONLY option was a large $75 piece of acrylic plexiglass. The others were soft glass and weren’t crystal clear like I needed. I bit the bullet. At my fault, we arrived about 15 minutes late and walked into Josh’s loft, who once again let us use his studio. The beauty of working with a male model is the zero need for hair and makeup! With a few touch ups and some hair treatment, we jumped right into the first set. Going into these sets I knew it would be a gross amount of post work, but with that intention I setup one light and just rolled with it, nothing over the top. 10 minutes into the first set I realized I had to make it more interesting. It was sort of empty and nothing was really intriguing about the images we were shooting. 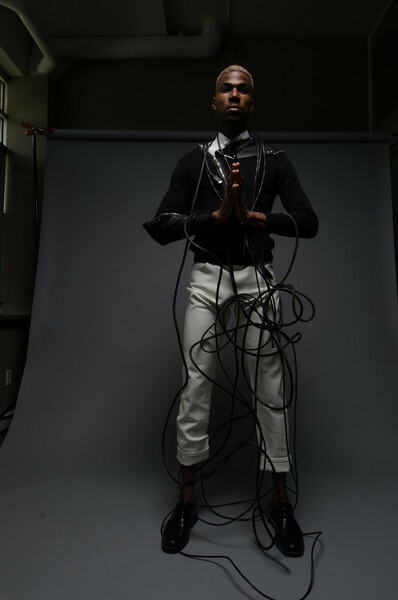 I happened to bring a few random black cables and we decided to wrap Mike up in them, it really added a interesting dimension to the image. There was something off about it which I liked. 45 minutes later, we moved onto the next set. Ever seen Minority Report or Ironman? I wanted Mike to be in some form of 3D environment with a digital display in front of him. But with a twist, I wanted the screen to look wet as if it was shorting out. Insert $75 acrylic plexiglass and a oil/water mix in a spray bottle. We tried several methods and even attempted some double exposure techniques, but all came up short except for one small group of images that really were compelling. Although I’m sure it was pretty awkward, Mike pulled out all the stops and did a phenomenal job. I really enjoyed working with him in the studio, he really took direction well and ran with it. After we closed up the session, I showed off the raw photos to Scooter, Josh and Mike. The response was OK, but Scooter and I also knew the work had only begun. First set. I really want to strive for consistency throughout all the Fiction images and that being the first image B&W. I always shoot underexposed, because I can always bring up the exposure, I can’t save a blown out image. Mike being 6'6", nearly reached the top of the seamless backdrop and I like to shoot low to high, therefore pretty much all most shots were wide and a lot of ceiling. Not sure the reasoning behind the off center composition, probably just a lazy error of shooting in front of the light stand. I had about 100 images to work through and I chose this one because of the position of his hands and the expression of his face. It was dark and almost lifeless, which I really liked. I did some preliminary color correction in Lightroom, cooled the white balance, added contrast, brought up the exposure and then imported into Photoshop. Before I even went into B&W I did some major editing. I cloned out all the background(which took a lot of time) and centered Mike in the image. I then created a layer mask over Mike and really hit the shadows and details. Once it was all cleaned up, I did some re-touching and cleaned up some lines. The image looked good. So I de-saturated the entire image to B&W and started the final phase of blending. I added two color fills, a slight orange and a light purple. Then I added two layers of a sound wave image that was motion blurred 100%, turned the blending mode to Screen. Then I added the titling and the image was complete. Second set. I really procrastinated on this image. I knew it would require some effort. I started the entire process by de-saturating the colors, bringing up the exposure and fill light. Then cooling the white balance and adding contrast. Imported into Photoshop. I took the clone tool and removed any unnecessary background, I wanted to fill the frame with gray. Once completed, I re-touched the skin and did some dodging and burning. I had my image, but the fun had only begun. I ended up spending a great amount of time finding the perfect images for layering. Some were high-resolution royalty free, others we’re low resolution Google images. No matter, they would all be motion blurred anyway. Some of my search words were “digital”, “display”, “bitrate”, “binary system”, “blueprints”, “touchscreen”, “sound waves”, “3D fireworks” and more. I came up with a set of stock images that would work perfectly, I laid them overtop one after another and blended them until I had it right. Most were set to Hard Light, Screen or Overlay. Once all the layers were in place I did some minimal color balance and dodged the darker areas. I then added two color fills to really bring out details. I stepped away from the picture for about two days and came back on it. I did some minor tweaks with the color and added in some more motion blur on Mike’s face as if he was moving. In the end there would be nearly 30 layers on the image. It didn’t exactly recieve the response I had hoped, but I’m very proud of the photo and the fashion. There is much more to come of this series, so stay tuned. Since that day I’ve worked with Mike again on an amazing video project which is set to debut in August. Be sure to leave a comment below and tell me what you think of the images!